“A major shift in investment towards low-carbon sources of power generation is underway”, according to a first-ever detailed analysis of investment across the global energy system from the International Energy Agency (IEA). Yet, in non-OECD countries, “investment in conventional generation remains strong”, with over 75 GW of coal-fired power plants starting operation in 2015 in “developing Asia” – “as much as all renewable capacity additions in the region combined”. A “shift” may be underway – it is not going fast enough. 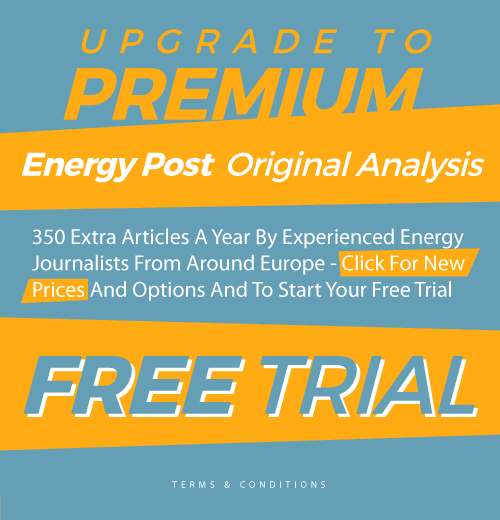 Looking at the energy sector from an investment perspective, provides a useful “test” to the reliability of the developments reported in the other major reports. Investments after all determine what will really happen in the energy sector. 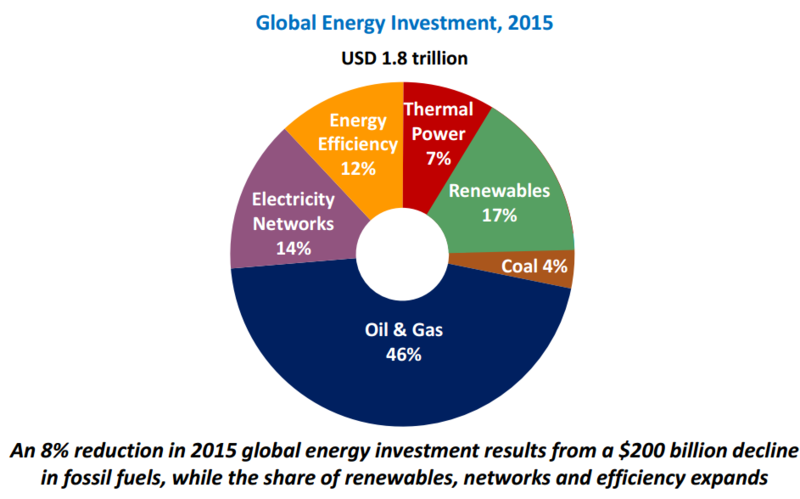 In this sense, the World Energy Investment 2016 offers no major surprises. Its overall conclusions confirm the consensus views of analysts about where the energy sector is going. Yes, towards more renewables (and more nuclear), but no, “not fast enough” to limit temperature increases to 2 degrees Celsius. Still, behind those generalisations there are plenty of interesting facts to emerge from this report. First of all, global energy investment declined last year by 8% (in real terms) to $1.8 trillion, mainly due to “a sharp fall in upstream oil and gas investment”. 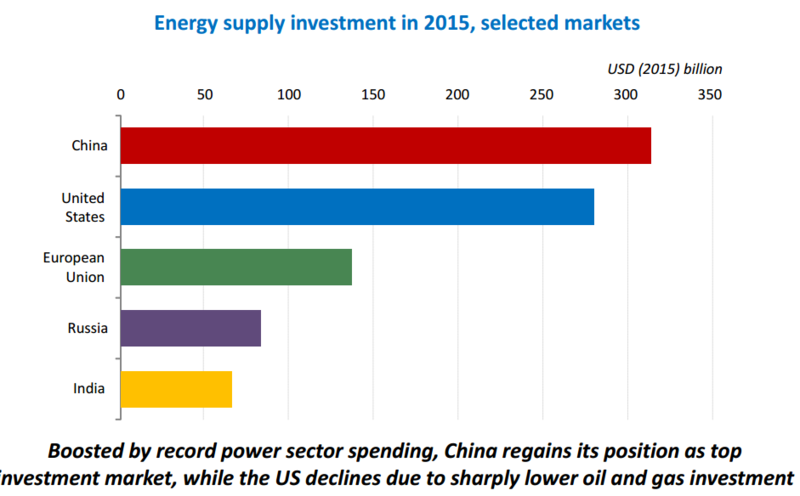 China “retook” the number one position from the US as top investor: whereas US investment in oil and gas production fell sharply, Chinese investment in the electricity sector rose to a “record level”. China increased its investment both in renewable energy and in nuclear power. Oil and gas still represent the largest single category of global energy investment, reports the IEA, accounting for over 45% of the total. 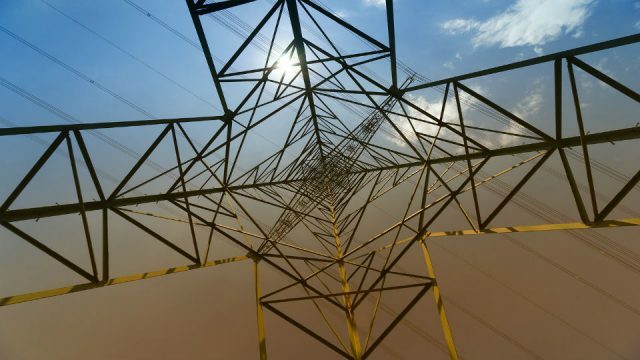 Investment in the electricity sector rose to a record $690 billion, or over 37% of the total, “despite a marked slowdown in demand growth, driven primarily by the expansion of renewables and networks”. It will come as no surprise, then, that “fossil fuels continue to dominate energy supply”, but “the composition of investment flows points towards a reorientation of the energy system”. Oil, “the largest primary energy source, slightly increased its share of the global energy mix”. Gas demand growth on the other hand remained “subdued”, as a result of a slowdown of electricity demand and the expansion of renewables. Elsewhere the report speaks of “the looming collapse in investment in LNG from 2017 on”. Interestingly, “upstream oil investment remained robust in Russia and the Middle East, helping to push up the share of national oil companies (which dominate production in those regions) in oil and gas upstream investment to an all-time high of 44%.” In Russia, capital spending even increased in ruble terms, helping to stabilise Russian production at a post-Soviet high. 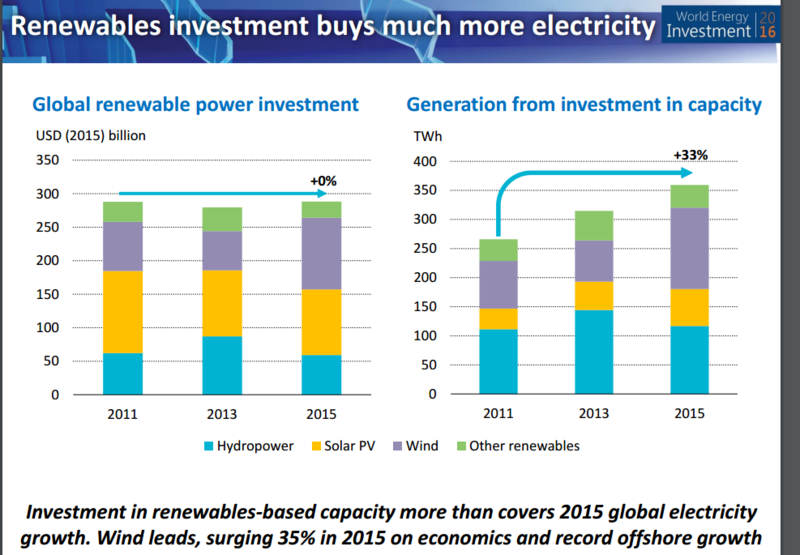 Renewables “are expanding rapidly”, notes the IEA, “but asymmetrically”. 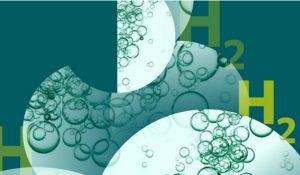 Whereas “wind, solar and hydropower are reshaping the electricity system”, with the exception of solar heat in China, “the investment in biofuels and renewable heat remains minor”. Renewable energy investments of $313 billion “accounted for nearly a fifth of total energy spending last year, establishing renewables as the largest source of power investment”. Nevertheless, in US dollar terms renewable investment has remained “relatively stable” since 2011. Spending on renewable power capacity “was flat between 2011 and 2015”. However, electricity generation from this new capacity rose by one third, reflecting “the steep cost declines in wind turbines and solar PV”. The investment in renewable power capacity in 2015 generated “more than enough to cover global electricity demand growth”. So while the money spent on renewables is not going up (or down), the amount of electricity produced by renewables is rising substantially, thanks to lower cost. Notably solar PV and electricity storage saw much lower cost, as a result of technology improvements and “learning by doing effects”. 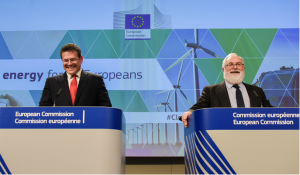 The cost of onshore wind fell 3%. Nuclear power investment reached its highest level for two decades in 2015, largely due to expansion in China, “where new nuclear capacity is reducing the need for coal-fired generation”. But in Europe and North America, “low wholesale prices, weak carbon price signals and project management problems continue to hinder nuclear investment”. 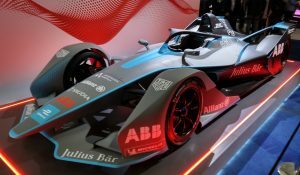 To really get to a low-carbon economy, “a combination of accelerated technological innovation and an investment framework aimed at encouraging rapid, large-scale deployment of low-carbon technologies will be essential”, the IEA concludes. 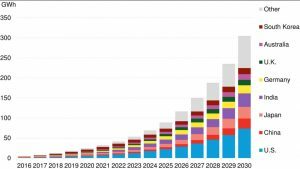 Thanks for the excellent summary of global energy investment in a shifting world energy demand. Clearly, in developing countries energy poverty drives investment as evidenced by the continued investment in sub-critical coal and other fossil fuels. 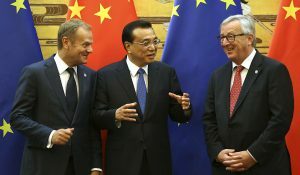 In the US, China and Europe the shift to renewable and nuclear appears to be accelerating which will eventually lower carbon emissions from these regions. One country you neglected to mention was India whose demand for energy continues to increase at rates much higher than even China and who continue to struggle with energy poverty. I believe the Indian government is interested in moving toward low carbon energy production but their need for cheap power to sustain economic development will drive an increased use of coal and gas. The Indian government has recently issued a joint solicitation with the US Department of Energy to focus on increased energy resilience through Microgrids which can more effectively use local distributed generation from renewable energy resources while improving their ability to provide power to remote rural parts of their country without investing substantially in the large national power grids which have become increasingly unreliable. Our university is collaborating with Amrita Vishwa Vidyapeetham (Amrita University) related to this focus. Again, thanks for your outstanding summary of global investment in energy.